My time as an Assignment Editor provided many stories on which I shared in my first blog. While I'm no longer On the News Desk, the stories and lessons shouldn't be forgotten. Almost three months have passed since I last wrote and announced my decision to leave CBS4 News after 10 1/2 years On the News Desk. I’ve been waiting for my feet to find steady ground. I’ve been finding my new place and how exactly I fit. I’ve been too exhausted at the end of the day to write. I have composed many blogs in my mind and seriously need to start recording my thoughts so they aren’t lost! I’m taking a very serious, critical look at my time thus far as Digital Content Manager at 9NEWS. Only seconds have passed and the truth is hitting me upside the head: I haven’t spent enough time, nor have proper planning to actually have moved the station more than an inch in effectively utilizing social media. This truth is quickly followed with a smack to the other side of my head: I haven’t lived what I’ve been preaching. I am a Journalist using Social Technologies and Interactive Media to connect with news consumers. 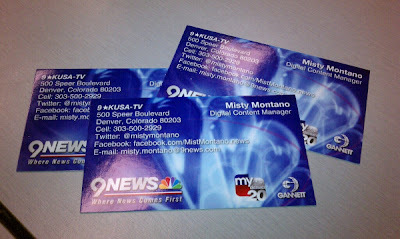 I am the Digital Content Manager at 9News in Denver, CO. Previously I was an Assignment Editor at CBS4 News in Denver where I won my first Regional Emmy for my work and spent the first 10 years of my career. I truly grew up On the News Desk.